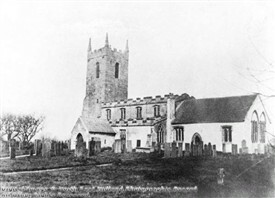 Above is a photograph from the south-east taken before the 1871-72 refurbishment, probably about 1860. The photograph seems to show the church still in open country. The church was rebuilt by 1898. 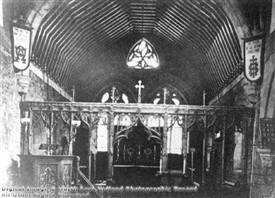 Above is an image of the interior of St Giles in around 1895, before it was rebuilt in 1898. Over the centuries St Giles has known a number of alterations and adaptations. In the course of the 1871-72 refurbishment and under the supervision of no lesser architect than T.C. Hine, one local historian took an active interest in surveying the work and did not hold back his criticism when this seemed to be called for. In the September and November 1895 editions of Notts & Derbyshire Notes and Queries W. P. W. Phillimore submitted two articles from which we reproduce extensive sections below. by W. P. W. Phillimore, M.A., B.C.L. In 1871 West Bridgeford was still a pretty country village, and the railway had not done away with the footpath through the fields leading to the church, which hitherto had not undergone the ordeal of "restoration." Living then at Snenton, I frequently took a walk across the Trent Bridge to West Bridgeford church. The restoration of the church took place in the latter part of that year, and I made constant visits to it during the progress of the work, and took careful notes about it on each occasion I was there. It may be of interest to those who have only known St. Giles' Church in its present restored con­dition to have some account of its former state, and the restoration which was carried out under the direction of a local architect. The church was, no doubt, in want of considerable repair, and the interior was disfigured by high deal pews of irregular shape, whilst a singing gallery, erected about seventy or eighty years ago, blocked up the tower arch. The chancel was filled with square pews, put up some time in the twenties or early thirties, at a time when the use of a chancel was pretty well forgotten, or was viewed as an anachronism, or, at best, a survival from "Roman" days. The chancel appears to have been new-roofed then, and was generally "beautified," a process which was as destructive in the days of our grandfathers as "restorations" are now. A flat ceiling had been put in, blocking up part of the two beautiful east windows of the chancel, as well as the curious triangle window above them. The easternmost lancet window on the north side of the chancel was then walled up, and the exterior stuccoed to represent masonry. Benches — taken, it is said, from St. Mary's, Nottingham — formerly existed in the chan­cel, but these were replaced by the pews already mentioned. Over the chancel screen had been a singing loft, but this was done away with, as well as the staircase on the south side which led up to it. The architect during the restoration pulled down some portion of the north wall in an unsuccessful attempt to dis­cover the stairs to this rood loft. Whitewash covered the whole of the interior, but, depressing in appearance as whitewashed walls are, many will agree in the opinion that bare rubble walls, roughly pointed, are not a bit better in appearance. The first steps were taken on the 11th of August, 1871 , when the workmen, without any adequate supervision, commenced to remove the fittings and to strip the plaster from the walls. My first visit was made on 21st August. By that time, a little window in the gable of the porch, which had been plastered up, was exposed to view, and the lancet window in the chancel before mentioned had been opened out. In connection with the latter, a most interesting discovery was made. The window jambs and arch were painted in a sort of distemper to represent sienna and white marble in a somewhat conventional manner. On the western side was a large shield of early form outlined with a broad black line. It was in height 2ft. 8in., and 1ft. 9in. wide, and bore argent, five fusils gules, each charged with an escallop of the field. The fusils, which were 17in. long, were painted in vermillion, and the escallops were outlined in black. These appear to have been the arms of the ancient Nottinghamshire family of Aslacton, of Aslacton, though no mention of this family is to be found in the pages of Thoroton in connection with West Bridgeford . * The day after these par­ ticulars had been noted, this interesting painting was scraped off by the workman. It may be worth while noting that in the demolition of the chancel wall old arched stones of some earlier building were found. By November one of the doves in the stained glass of the east window of the aisle had disappeared, as also the stained glass, a crown, in the second south window. The two alabaster sepulchral slabs in the chancel were cut up to form the communion step; one of the slabs, that which lay next to the chancel door, was found to be inverted, thus indicating some earlier disturbance of the floor. This page was added by Betty Rose on 28/09/2011.